Today #DamienTalks with a pair of Southern California bicycle advocates, BikeSD’s Samantha Ollinger and the Bicycle Culture Institute’s Nona Varnado. First, #DamienTalks with Ollinger about the exciting plans for Downtown San Diego. The City Council will vote next week on a plan to add 9.3 miles of protected bikeways and 5.5 miles of pedestrian greenways to the two square miles that make up Downtown San Diego. Once implemented, San Diego would leap past pretty much everyone for safe streets planning in the urban core. However, it’s not a done deal. If you live, work, or play in San Diego, you can click here to get your voice heard. 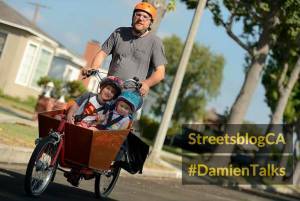 If you want to read more, here’s last week’s story on San Diego’s plans in Streetsblog USA, based on research in Next City. Next #DamienTalks with Nona Varnado about the upcoming Los Angeles Bicycle Festival. Tickets are on sale now:$10 for individuals and $15 for families. There are lots of goodies for people who buy their ticket *in March*. For more information click here for the Festival’s webpage, here for the Facebook page or, ya know, just LISTEN TO THE PODCAST.